Laparoscopic herniorrhaphy requires detailed knowledge of pelvic anatomy. In fact the operation requires the surgeon to start from the deeper structures and work toward the more superficial layers. This unfamiliarity with internal inguinal anatomy may be one of the reasons that surgeons are uncomfortable with learning laparoscopic herniorrhaphy. The initial landmarks for the transabdominal preperitoneal repair include (i) the medial umbilical ligament, which contains the obliterated umbilical arteries and (ii) the lateral umbilical ligament, which contains the inferior epigastric arteries. The direct space is seen medial to the epigastric vessels and the indirect space lateral to the vessels and adjacent to the cord structures within the internal inguinal ring. 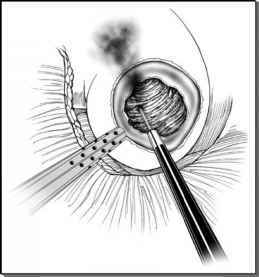 Once these key structures are identified, the hernia sac can be reduced, and mesh repair undertaken. Knowledge of the regional nerves is critical to avoid the neuralgias that had complicated the early laparoscopic repairs. Important anatomic triangles have also been identified in laparoscopic hernia repairs. The "triangle of doom" is bounded by the medial aspect of the ductus def-erens and laterally by the spermatic vessels and houses the iliac vessels and femoral nerve. The "triangle of pain" is made up of the iliopubic tract and the spermatic vessels and contains the lateral femoral cutaneous nerve and the genitofemoral nerve. These two regions should be avoided during fixation of the mesh to the transversalis fascia. Gigantic scrotal hernias are difficult to approach laparoscopically. The initial landmarks for the transabdominal preperitoneal repair include (i) the medial umbilical ligament, which contains the obliterated umbilical arteries and (ii) the lateral umbilical ligament, which contains the inferior epigastric arteries.